Surrounded by water and set among the spring-time cherry blossoms of West Potomac Park, the Thomas Jefferson Memorial is one of DC's most beautiful and revered memorials. Step into the Neoclassic memorial, resembling the Roman Pantheon, and marvel at the 19-foot statue of Thomas Jefferson under the memorial's awe-inspiring dome. Walk through the open-aired, columned memorial to read engraved panels with Jefferson's most inspiration quotes, including his call for American independence and man's right to "life, liberty, and the pursuit of happiness." 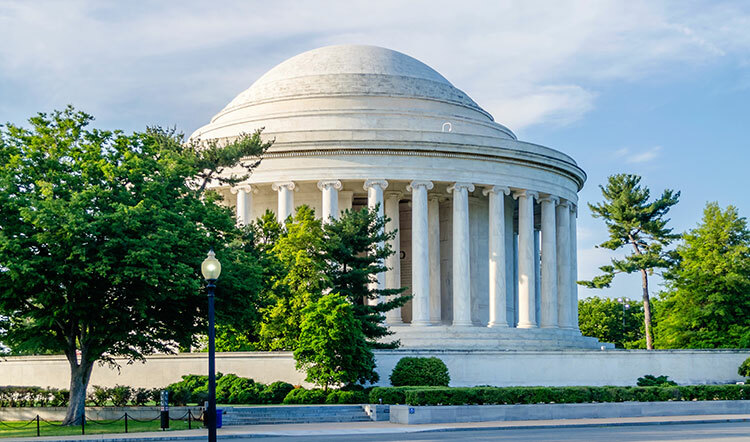 Dedicated to the writer of the Declaration of Independence and third President of the Unites States, the Jefferson Memorial honors the Founding Father's many contributions to both the U.S. and humanity. How can I get to the Jefferson Memorial via public transportation? The most convenient way to visit the Jefferson Memorial is via the Washington, DC Metro or Metrobus. The closest Metro station to the memorial is the Smithsonian on 12th Street and Independence Avenue on the Orange and Blue lines. From the Smithsonian station, allow for a 10 to 15 minute walk. If traveling by bus, take the 32, 34 or 36 routes. What can I expect to see at the Jefferson Memorial? The Jefferson Memorial is one of the most beautiful memorials found in Washington, DC The Neoclassical architecture, favored by Jefferson himself, resembles the Pantheon in Rome. Surrounded by white, towering columns stands a 19-foot bronze statue of President Jefferson. Along the walls of the memorial are inscriptions of Jefferson's most famous quotes taken from various texts, including the most famous words in American history - the opening passage of the Declaration of Independence.